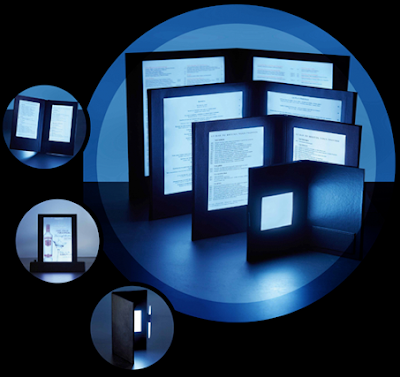 NEW LED BACK LIT MENU MODELS ARE NOW AVAILABLE!! GLOW BACKLIT/ILLUMINATED L.E.D. 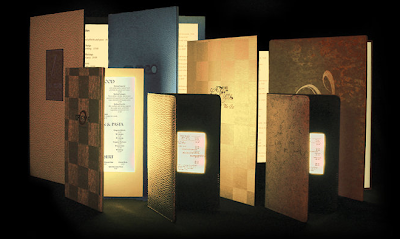 MENUS, L.E.D. CHECK PRESENTER AND 2 COLOR L.E.D. 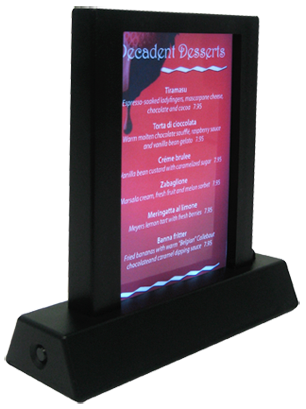 TABLE STAND/GRANDSTAND FOR ALL VENUES..
4 LED Menu Sizes as well as LED Check Presenter, Lowest Prices guaranteed! NightclubSuppliesusa.com is happy to offer one of the world's first ever rechargeable ILLUMINATED LED light up/back lit menu 's, along with LED Check Presenters & The Tabletop LED Grandstand. 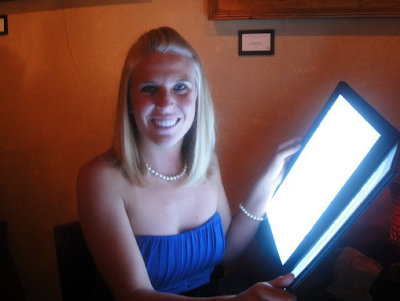 These designer Glowing LED Menu pieces are the tables showcase in any venue, restaurant, vip area, and always set an upscale and mood and give just the right detail. 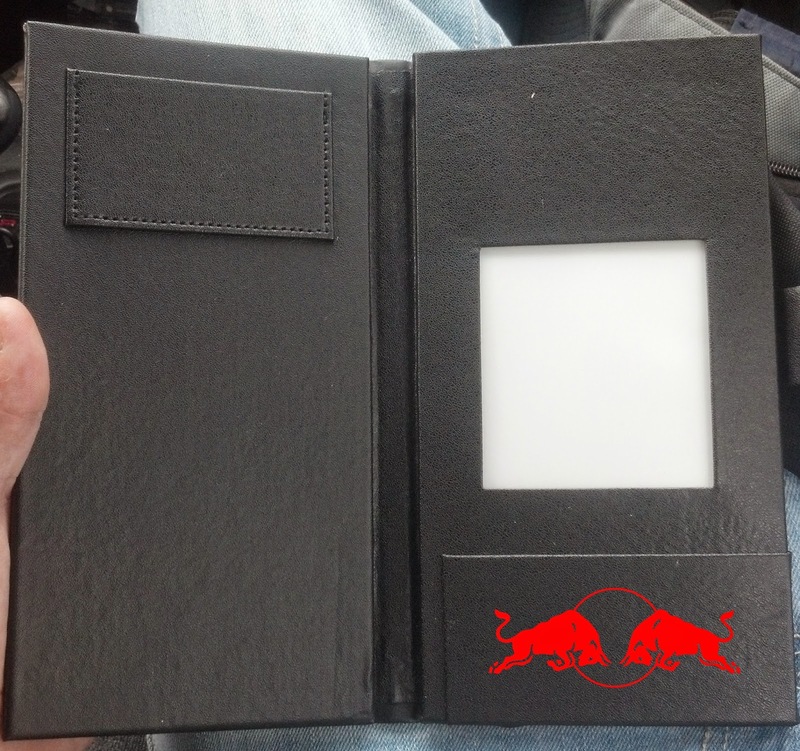 Customizable in color as well as Cover Logo or Art. These Illuminated LED MENUS come in 4 (four) different sizes. 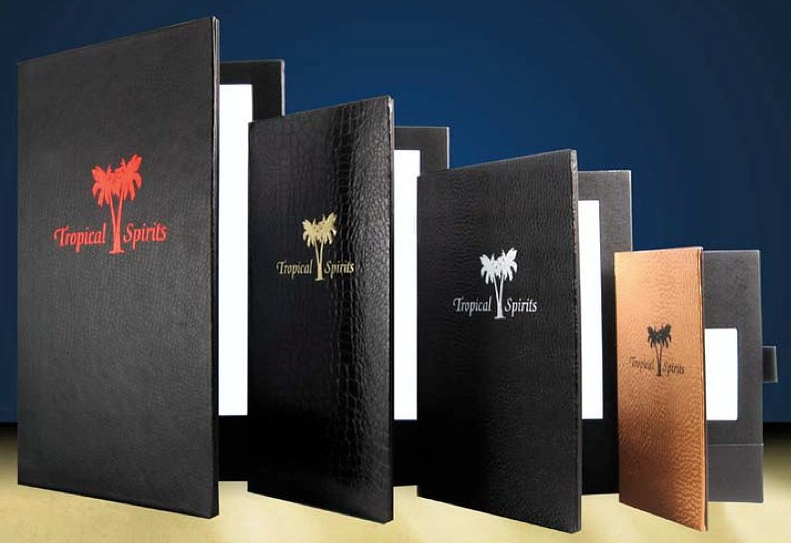 All of the Menu sizes are measured by the interior insert size, to make it easy for you to know which one will suit your needs better. Utilizing the latest in LED technology, these menus and check presenters illuminate and light up only when they are opened, and automatically shut off when they are closed to help conserve their battery life. Wholesale and Bulk Pricing Available, Lowest LED Menu Prices Guaranteed!!! 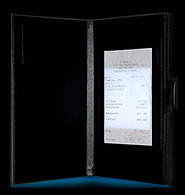 As pictured below, you can see a tremendous difference between this Menu insert being inside compared to outside of the Backlit/Lighted LED Menu. This is also just as equally visible with the Backlit/Lighted LED Check Presenter and LED tabletop Grandstand can help your staff avoid situations where patrons or even the staff members themselves have misread the receipt due to lack of visibility and are not able to pay/process the bill correctly. If your interested in customizing your Menu order please call 1-866-437-7557 for details. The LED Grandstand Table Top is a fantastic and new exciting item to add to your Venue or VIP Bottle Service section. 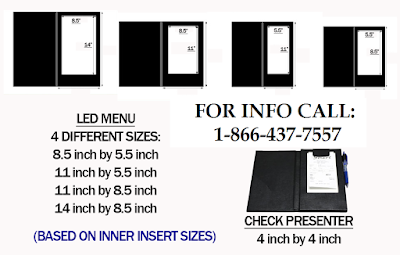 It is part of our "Nightclub Supplies USA LED Menu & Check presenter collection". 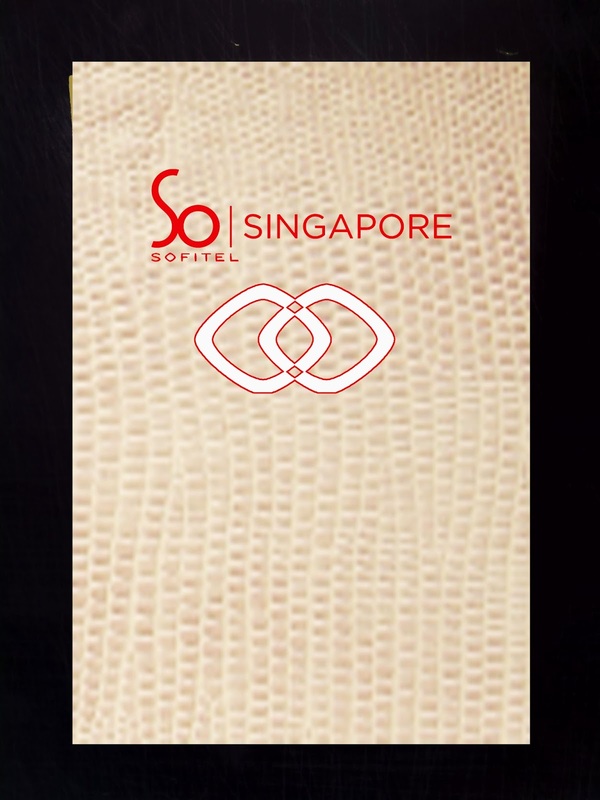 It Illuminates and highlights anything inserted inside of it, and shows off your Venues best deals! This table stand holds a 6"h x 4"w (inches) inset on both of the sides. It features an "on/off" switch with a button for call service. When you press the for "service" button, on the LED grandstand, The illumination and LED's change from WHITE to RED signaling your staff that the table is in need of service. This LED Illuminated Grandstand / Table top stand is made of black ABS plastic, it is a very strong and durable product, this great looking item will be awesome for VIP AREAS, LOUNGES, NIGHTCLUBS, SPECIAL SECTIONS, BOTTLE SERVICE or even on your regular tables, but this item will always keep you and your staff more aware of your customers needs right on time with its color changing capabilities! 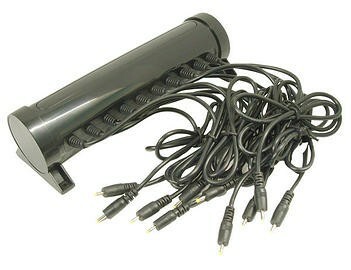 These units are rechargeable and last approximately 12 hours of continuous use. 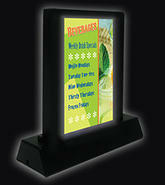 This Backlit LED Check Presenter is an awesome and great new addition to your "LED MENU Collection." 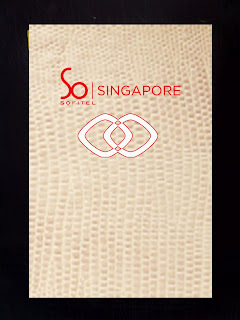 It has a small credit card pocket inside of the front cover, and a pen loop to hold a pen, we even carry illuminated pens to accompany this item. The LED Check presenter or Check / Bill Cover has a receipt pocket inside the back cover as well, just below the 4" x 4" LED Window. This "LED Check Presenter" is always a great way to avoid any confusion on any bill or receipt in any low light dim light situation, or even in a completely dark room. Once fully charged, the LED Check presenter can last you an average of UP TO 8 hours. LED BACKLIT, LIGHTED INSERT, MANY CUSTOM COLORS AND CUSTOM MADE OPTIONS AS WELL AS COMPLETELY RECHARGEABLE! LED CHECK PRESENTER. 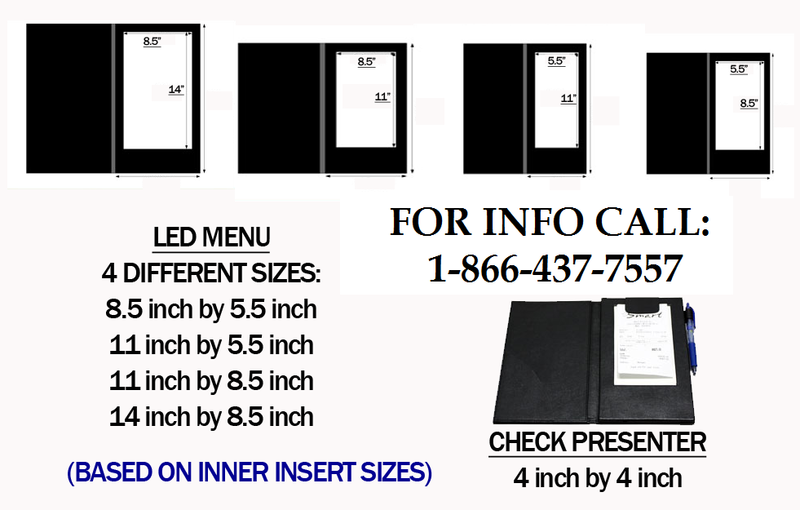 We offer Discounts in Bulk for these units but as dealers we are limited to adjusting the Price until 25 LED MENU Units have been purchased. Unlike many of our other products, we do not have much play on these LED GLOW MENUS but do offer the highest quality and best service in the Industry. 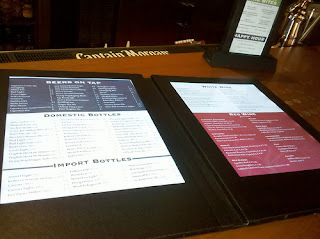 We carry the Newer LED MENU Designs that have the single Micro USB Charger instead of one on each side. This is the newer type of LED MENU and much brighter as well as better quality. 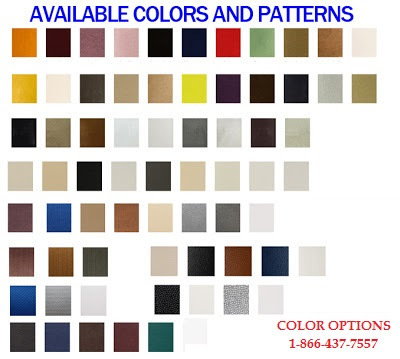 Call us today to inquire about our LED MENU Products. The Red LED light tells you that the unit is charging. The Green LED light indicates that the unit is fully charged. This has the ability to be mounted via screws to a wall for stability. The Approximate time to charge the product is 4-6 hours. The Red LED light tells you the Unit is charging. This has the ability to be mounted by screws to the wall for stability. The approximate time to fully charge a LED MENU Unit is 4-6 hours. The Filling station works with Menus, Check Presenters / Covers, and Grandstand. Questions??? CALL US TODAY! Yes, We are Human! NightclubSuppliesusa.com your Wholesale Nightclub, Bar, and Party Supply secret weapon! New Pictures are up! Customize LED Menu's with your own Logo or Art, Wholesale / Bulk Pricing Available, Lowest Prices Guaranteed! I need parts circuit boards and switches .